Hunting isn’t good just for the environment and controlling wildlife population. But Why Hunting is Good? When hunters do hunting, they are paying taxes to the government. In that cases government enhances and manage wildlife refuges, making the animals parks beautiful etc. Alternatively, hunters do benefit the natural environments by paying hunting taxes. Do you know that a hunter enters into a partnership ecologists research, groups, and communities interested in wildlife recreation and habitat protection? In reality, no specific part of the animal goes to waste while every part is beneficial to these cultures. Some animals skins use to turn into blankets, clothing, shoes and other useful tools. Selling these part in the market is a way of income too. 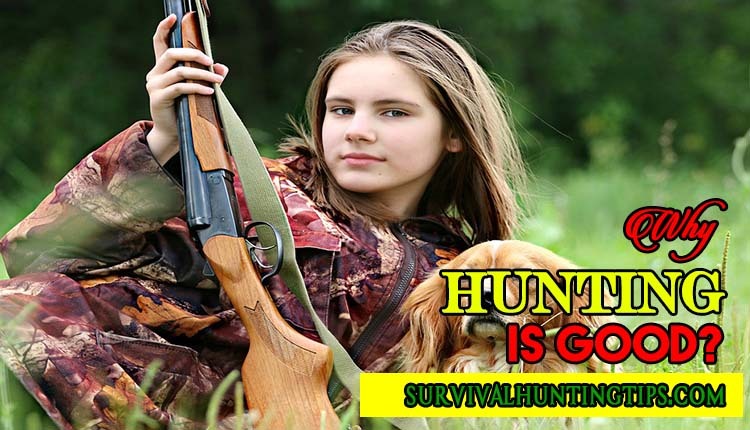 Hunting skills also offering you a survival in a lost situation and producing an effort to search and find food resources to sustain your life while long waiting rescue. Hunter learn outdoors activity recognize animal habits and tracks. Get chance to learn tactics in case of prey going to escape and discover wildlife natural trail which can’t feel by just watching on TV. Do You Know How Many People Are Hunting? Hunting animals is beneficial to protect and control the wildlife population in terms of biological consuming cycle. Example of Deer that can safely taste and east around 700 different species of plants. Which is causing damages in an area if deer is overpopulation. A group of deer would cause huge damages in a single day where hunting is a way to control their population and protect other species. Do you know deer hunting? Best Time Of Day To Hunt Deer. While some countries with limited species will not allow you to hunt in order to protect them. Thus geographically the human nature is to control and protect the species and wildlife. The extreme debate among the people with the different opinion whether hunting is good or bad. Every country having their own policy and protection for wildlife animal. It is all about geographic location to ban limited species for hunting while allowing overpopulated animals free to hunt. Controlling and overseeing by the government through different methods such as tax, license fees, and wildlife control officers. The income from your fees and taxes use in recovery of wildlife animal and protection of limit species. You might be wondering how hunting is as good as a sport? Well, as per lots of hunters a sport is a tradition that tests skills and abilities. Hunters don’t just kill and eat the overpopulated animals but also they run, they suffer, track, wait, learn behaviors, etc. Each individual required during hunting to set up, camp, survive in difficult condition. The unique way of getting physical and practical life exercise. That is the reason why they see hunting as a sport. Moreover, the hunter should enough knowledge about the hunting equipment and its use. When we talk about the expenditures for types of equipment for hunting, they did not even change in the US. They are increasing and reached around 13 million people, 7% of the U.S. population. However a large number of hunting in the US is fishing, and the large number of 21 years old went hunting past years. Hundreds of year back the human survival is to feed their families while hunting animals. It was the only primary method to get protein-rich foods when there was no agriculture food development and farming methods. Answering the similar question why hunting is good hundreds of year back is to feed themselves and family for life survival. A single hunt would possibly provide food to the family for few days. But no hunting afterward means no food and possibly go to die after long starvation. In a modern age still, some tribes have a tradition of hunting that must perform by a male member to consider him a man. Following old tradition is not just feed their family but at least to perform once and consider him as tradition follower with respect. Millions of people globally doing the hunting for exercise, considering hunting as a sport. While others doing the hunting for food. There is the reason why people hunting for food. Their main objective of the hunt is to bring some food to home (game meat). If you don’t know what Game Meat is? Game meat is a lean protein it’s a meat from deer, elk. One of the best things about the game meat that there is the lower number of fat in it. Other than the deer an elk, there game birds, like pheasants and partridge. Rabbit meat has also lean protein and lower number of fat. The lower number of fat and a large number of lean protein make you feel healthier. The fresh meat also helps in avoiding disease as compared to the meat in stores. The rest of the items that you need is based on the type of hunting you go. But we are suggestion some survival tools, bag, belts and other accessories. Learn Why hunting is good general and specifically for sport, survival, and food. A long time ago it was the only survival way of life get rich-protein foods. It can also be a source of feeding your family and income source. It is also an effort from human to control and protect wildlife population. Government involvement to protect the wildlife and ban hunting of some species in the fewer population. Getting involved in hunting need a license and permission with all safety and survival equipment such as Emergency First Aid Kit Survival (click here) and few other as mentioned above. Do not forget to comments below if you have any question or share your thoughts.